The Bourse ended the week on a negative note as the ASPI decreased by 106.01 points (or -1.85%) to close at 5,616.24 points, while the S&P SL20 Index also decreased by 98.49 points (or -3.44%) to close at 2,761.10 points. Turnover & Market Capitalization Commercial Bank was the highest contributor to the week’s turnover value, contributing LKR 1.32 billion (Bn) or 38.47% of total turnover value. JKH followed suit, accounting for 14.07% of turnover (value of LKR 0.48Bn) while Nations Trust contributed LKR 0.36Bn to account for 10.35% of the week’s turnover. Total turnover value amounted to LKR 3.43Bn (cf. last week’s value of LKR 4.18Bn), while daily average turnover value amounted to LKR 0.69Bn (-34.37% W-o-W) compared to last week’s average of LKR 1.05Bn. Market capitalization meanwhile, decreased by 1.85% W-o-W (or LKR -49.54Bn) to LKR 2,625.08Bn cf. LKR 2,674.63Bn last week. Liquidity (in Value Terms) The Banks, Finance & Insurance sector was the highest contributor to the week’s total turnover value, accounting for 58.13% (or LKR 2.00 Bn) of market turnover. Sector turnover was driven primarily by Commercial Bank, Nations Trust, Sampath Bank, L B Finance & Union Bank which accounted for 83.98% of the sector’s total turnover. The Diversified sector meanwhile accounted for 17.16% (or LKR 0.59 Bn) of the total turnover value, with turnover driven primarily by JKH & Hemas Holdings which accounted for 96.62% of the sector turnover. The Beverage, Food & Tobacco sector was also amongst the top sectorial contributors, contributing 15.20%(or LKR 0.52) of the total turnover, where sector turnover was primarily driven by Distilleries & Cold Stores which accounted for 79.58% of the sector turnover. The Banks, Finance & Insurance sector dominated the market in terms of share volume, accounting for 39.10% (or 33.14Mn shares) of total volume, with a value contribution of LKR 2.00Bn. The Beverage, Food & Tobacco sector followed suit, adding 25.32% to total turnover volume as 21.46Mn shares were exchanged. The sector’s volume accounted for LKR 0.52Bn of total market turnover value. The Diversified sector meanwhile, contributed 7.02 million (Mn) shares (or 8.29%), amounting to LKR 0.59 Bn. East West was the week’s highest price gainer; increasing 25.0% W-o-W from LKR13.60to LKR17.00 while LOLC Development Finance(+16.0% W-o-W), Laxapana (+15.3% W-o-W) and Palm Garden Hotel (+11.6% W-o-W) were also amongst the top gainers. Tess Agro were the week’s highest price loser; declining 25.0% W-o-W to close at LKR0.30 while Renuka Hotels (-20.0% W-o-W), SMB Leasing(-20.0% W-o-W) and Blue Diamonds(-20.0% W-o-W) were also amongst the top losers over the week. Sri Lankan equities continued to lose ground on the back of lower investor activity as investors remained cautious ahead of the final vote on the 2019 Budget in April. The broad-share index registered six straight sessions of weekly losses to close at 5,616.24 points, recording the highest weekly loss of ~106.0 index points (-1.9% W-o-W) so far during the year. The Banking sector, currently in the midst of a capital raising initiative through rights and debentures, faced increased selling pressure on Monday as HNB (-6.8% W-o-W), Commercial Bank (-2.9% W-o-W) and Sampath Bank (-6.2% W-o-W) dragged the index down ~42 points. Reports from Ratings Agencies (Moody’s & Fitch) raising concerns over the challenging deficit and debt targets set by the GoSL also impacted sentiment. Depressed market conditions meanwhile led to some bargain hunting on Thursday as the market recovered ~25 points to pare down the week’s earlier losses but gains were paltry as the market dropped a further ~17 points on Friday. Activity levels on the Colombo Bourse meanwhile were mixed during the week, remaining below the YTD average daily turnover of Rs. 0.7 Bn from Monday to Wednesday (average daily turnover was ~Rs. 0.35 Bn), reversing over the latter part of the week. Strong buying activity in Commercial Bank by Local HNI & Institutional investors on Friday meanwhile, pushed the average daily turnover to Rs. 0.7 Bn for the week. Crossings for the week consequently accounted for ~54% of total market turnover this week (cf. a mere 15% last week) as index heavy-weight Commercial Bank accounted for ~68% of the week’s total crossing while large parcels in Distilleries (12% of crossings) and Nations Trust Bank (13% of the crossings) also helped drive activity levels over the week. 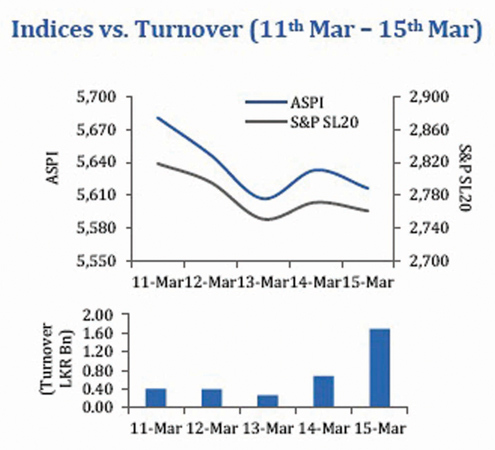 Foreign equity sell-off on Sri Lanka equities this week eased, with foreign investors recording a net inflow of ~Rs. 44Mn (cf. the net outflow of Rs.1Bn last week). Markets in the week ahead are likely to take cues from further political & economic developments and are likely to assume a ‘wait and see’ approach ahead of the final vote on the 2019 Budget. Sri Lanka’s trade deficit narrowed in Dec’18 for a second consecutive month as policy measures adopted by the CBSL to curtail vehicle and non-essential consumer goods imports led to a slowdown in import expenditure. Import expenditure in Dec’18 fell 15.3% Y-o-Y to Rs. 1.7 Bn (cf. Rs. 2.0Bn in Dec’17), the lowest import value for the year, mainly due to lower expenditure on fuel, vehicle imports, gold and base metals. Falling global crude oil prices in Dec’18 led to a lower import bill while import volumes of refined petroleum products and coal also fell during the month. The trade deficit decline was further supported by a marginal growth in exports to Rs. 1.0Bn during the month (1.4% Y-o-Y due to a base effect). Exports in Dec’18 were driven by higher textile and garment products (greater demand from USA and EU) and rubber products. Sri Lanka’s trade deficit however, widened in 2018 to $10.3Bn (cf. $9.6Bn in 2017) as higher import expenditure outweighed exports. Exports in 2018 grew 4.7% Y-o-Y to $11.9Bn relative to $11.4Bn in 2017, driven by earnings from industrial exports while agricultural and mineral exports declined. The growth in exports for the year was mainly driven by an increase in price versus volume as indicated by a 4.1% increase in export unit value index against a marginal increase in the volume index. Imports meanwhile grew 6.0% Y-o-Y to $22.2Bn for the year (cf. $21.0Bn in 2017) due to higher personal vehicle imports, fuel, fertilizer imports and textile. Other major inflows to the current account meanwhile were modest in Dec’18. Growth in tourist arrivals and higher average spending led to an in increase tourist earnings (4.8% Y-o-Y) but workers’ remittances continued to decline (13.0% Y-o-Y). Earnings from tourism in 2018 meanwhile increased 11.6% Y-o-Y to $4.4Bn while workers’ remittances declined 2.1% Y-o-Y to $7.0Bn. In terms of financial flows, negative investor sentiments meanwhile weighed on both government securities markets and the CSE in 2018. Government securities recorded a net outflow of $990 Mn while the CSE recorded an outflow of $55Mn in 2018. Gross official reserves at the end of Dec consequently fell to $6.9Bn (3.7 months of imports) while pressure on the rupee mounted as it declined 16.4% against the $ for the year. During 2019 thus far, the pressure on the rupee has eased resulting in a 2.1 % YTD increase.